The Eckert & Ziegler Radiopharma segment is a business division of the Eckert & Ziegler group, with headquarters in Berlin, Germany. With more than a decade of experience, we are one of the leading experts in nuclear medicine and molecular imaging offering individual, valuable and innovative solutions and services for the diagnosis and treatment of different diseases. A team of highly qualified employees and a strong network of international partners give us the ability to detect and set trends in the market, reinvent ourselves as well as our products and thus prepare you for future challenges. More than a decade of experience and high-qualified personnel are the keys to face our customers’ challenges. Advancement and continuous improvement provide the basis for our work attitude. Global partners complete our pursuit to offer tailored solutions. We contribute to personalized medicine as an expert and your strong partner in the field of nuclear medicine and radiochemistry. Our core competence is the provision of pharmaceutical services as well as versatile, innovative and high-quality technical solutions. Our expertise in trivalent metals for theranostic purposes empowers us to support ambitious startups and institutions with knowhow, technical and radiochemical support as well as financial assistance. Our well established network of production sites produces different radiopharmaceutical products for compound labeling. Furthermore, we offer contract manufacturing of medicinal products or components for clinical trial supply as well as commercial purposes. Although the Radiopharma business segment consists of different companies, we act in concert. Whether customers require a full package of radiopharmaceuticals, synthesis equipment and quality control or internal exchange of knowledge becomes necessary, our almost 100 colleagues cooperate to offer individual, valuable and innovative solutions. The highly qualified team comprises expertise in product design, electromechanics, radiochemistry, radiopharmaceutical production, software programming, quality assurance, logistics, business development, regulatory, service, sales, marketing and more. These professional skills combined with short communication paths make us cope with most complex challenges as a team. Although the Radiopharma Business segment consists of eight different companies, we act in concert. 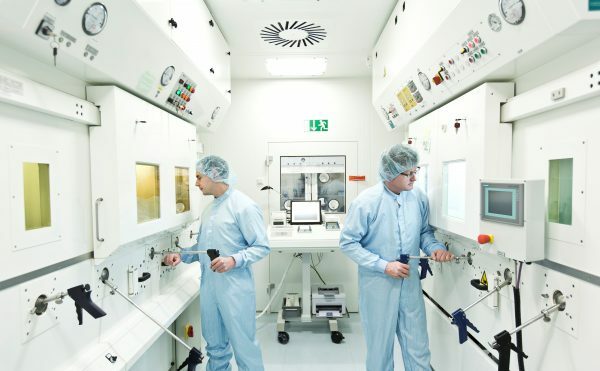 Whether customers require a full package of radiopharmaceuticals, synthesis equipment and quality control or internal exchange of knowledge becomes necessary, our more than 140 colleagues cooperate to offer individual, valuable and innovative solutions. The highly qualified team comprises expertise in product design, electromechanics, radiochemistry, radiopharmaceutical production, software programming, quality assurance, logistics, business development, regulatory, service, sales, marketing and more. These professional skills combined with short communication paths make us cope with most complex challenges as a team. 1995 Development of Radiopharma Segment by founding EUROTOPE Entwicklungsgesellschaft für Isotopentechnologien mbH, Berlin – a company that developed production lines, special sources and recycling processes for radioactive materials. 1997 Founding of Eckert & Ziegler Strahlen- und Medizintechnik AG, Berlin as the holding company for a number of specialized subsidiaries. 2000 Registration of FDG-EZAG (Fludeoxyglucose (18F)). 2005 Acquisition of 51% of the shares of f-con Europe GmbH. 2005 Acquisition of 70% of EURO-PET Berlin Zyklotron GmbH, Berlin. 2006 Registration of Yttriga ([90Y]Yttrium chloride, radiopharmaceutical precursor, sterile solution) in several European countries. 2006 The beginning of our synthesis devices: Modular-Lab Standard – a new approach of automated radiosynthesis. 2009 Acquisition of the isotope specialist Nuclitec GmbH, Braunschweig. 2009 Modular-Lab PharmTracer – A cassette-based solution for routine production. 2011 Acquisition of the Analytic Instrumentation and Radiochemistry Equipment Business from American market leader Bioscan, Inc. – the perfect complement to the existing Eckert & Ziegler Analytical Equipment. 2013 Modular-Lab eazy – the smallest automated synthesis system on the market. 2014 Approval of GalliaPharm® – the world’s first, approved 68Ge/68Ga radionuclide generator for positron emission tomography (PET) in the diagnosis of cancer. 2015 Registration of GalliaPharm® as a drug product in 12 countries of the European Union finalized. 2015 FDA Inspection of GalliaPharm® manufacturing facility in Berlin successfully passed. 2016 AAA’s NETSPOT® Gallium Ga 68 dotatate kit approval in the USA links GalliaPharm® as the source of the 68Ga. 2016 European Commission has approved SomaKit TOC™ (AAA), a kit for radiopharmaceutical preparation of gallium (68Ga) edotreotide solution for injection for PET with GalliaPharm® as the source of the 68Ga. 2017 Eckert & Ziegler Radiopharma sells its cyclotron division to Alliance Medical. 2017 Modular-Lab PharmTracer Tower – Cost-efficient Modular-Lab PharmTracer concept. 2018 KitLab – Fully automated and user-friendly stand-alone device for safe processing of cold kits. Contact us regarding your questions by filling in the form below and we will get back to you as soon as possible.